One of my favorite things to do in this business is to help young teachers perfect their craft. At the Carmel Golf Academy part of my training regimen is to observe my teachers and to video tape their lessons and watch them back with them. This is not an exercise to put them down or make them feel bad but to give them constructive criticism to help them improve. One of the biggest things that I had to learn as a new teacher was not to try to tell the student everything that I knew, which at the time wasn’t much! This is something that I preach to my staff constantly is knowing what to say, the language you use to say it and making sure you are 100% engaging the student and allowing them give you feedback. Most teachers talk to much in order to boost their ego and show the student that they know stuff which is not productive and definitely not a great way to gain the trust of the student. To gain the trust of the student you must LISTEN to them, carefully describe what you want them to learn and be open to positive or negative feedback in order to tailor the learning to the student. Results have to be a mutual decision or you may believe that they got better but if they don’t believe it then you’ve lost them. Check you EGO at the door coaches. 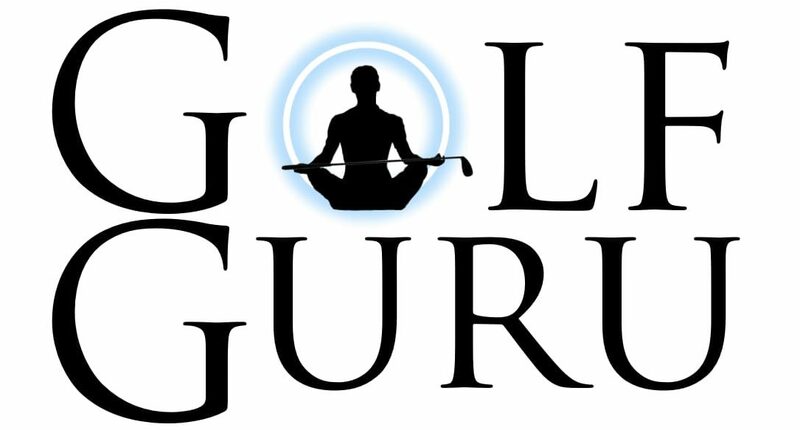 So this article has nothing about the who has the best philosophy, or the certifications that you have acquired or who can read the trackman numbers the fastest…..This is about how do you deliver the most understandable message with the least amount of babble to get the quickest results from the lesson. That to me is what the great teachers do for the students I am sure you will agree from your lesson experience. I was teaching a beginning women’s clinic the other day and invited one of my teachers to assist me. After the clinic was over, I asked him to evaluate me. He said,”I am always amazed about how little you give them but always make them improve and excited.” He said that before he thought he was cheating the student if he didn’t tell them or work on more stuff. I can see his point but the goal of the lesson is to improve and not to overload them with information. They will ask enough questions to keep you busy and even then you have to keep from self overload. It gets better–research has shown that students taught by active learning, on average, score a grade and a half higher than those who learn in traditional (boring) ways. 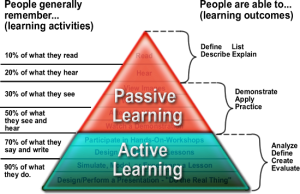 But, most teachers do not do use active learning. Why? I wish I knew. We tend to teach the way we were taught ourselves, rather than in the way that works best. We know too much, and rather enjoy explaining. Interesting… as this pertains to the classroom teachers but how can we apply this to teaching golf. So if the this is the priority of how people learn, why do we do #3 the most? hmmm. Because it is easy to tell someone but maybe more difficult to give them the other two which are more important. So here are some ideas on how to “Talk Less and Guide Learning Faster” and students pay attention because your coach needs you to give great feedback as well. 1. Interview well – Ask open-ended questions and be observant. I have a big list of questions that I ask a student in the interview but the big 3 are as follows 1)What is your main goal and what does it look like (specific) What is your big ball flight miss (shot that they can’t survive) and 3) What are you trying to do” (their model) close 4th is physical limitations of course. As they answer your questions (don’t interrupt or try to help them) observe where their eyes go and how they stand. kinesthetic players look down and visual players look up. Auditory players may go all over the place. Are they favoring one side and what are they wearing? (more on that later) This observation continues throughout the lesson as you explain, model or manipulate….notice where they are looking and continue to ask questions. Do they close their eyes or keep them open as you move them? 2) Watch Your Language – Every lesson is a presentation. After I video tape their motion and we are going through the swing, CHOOSE your language carefully and MEET them where they are. By now you should know the students background, who they have had lessons from (which is why you should study all methods), occupation and sports history so this should help you in explaining what exactly what you want them to see. (key) Don’t point out every fault or strange movement in their motion but only the things that you want them to see and that you want to focus on in that lesson. Especially people who this is their first time that they have seen their swing, it can be overwhelming so be careful. Depending on their lesson experience and background you will know the words you can use or can’t use. The average golfer isn’t going to know what the 3rd accumulator, p4 or spin loft means so you are constantly checking for understanding. “Do you understand what this plane line is for?” Use language that they can relate to without the ums, uhs and kind of’s so it is clear and concise. I highly recommend that you listen to your video analysis emails that you send to your students for evaluation to help you improve your presentation. So meet them where they are. 3) Learn To Model and Manipulate Properly – Once I have explained what we are going to work on, I either Model (visual) or Manipulate (kinesthetic). Neither of these exercises require a ton of verbage which is nice. In my opinion, manipulating or moving a student into the correct positions is a lost art. If you are standing behind the trackman or the video and telling the player to move a certain way and getting in there and moving the student around then you are doing them a disservice. I teach this to my staff. Where to stand and proper hand placement. When to exaggerate and when to be perfect. 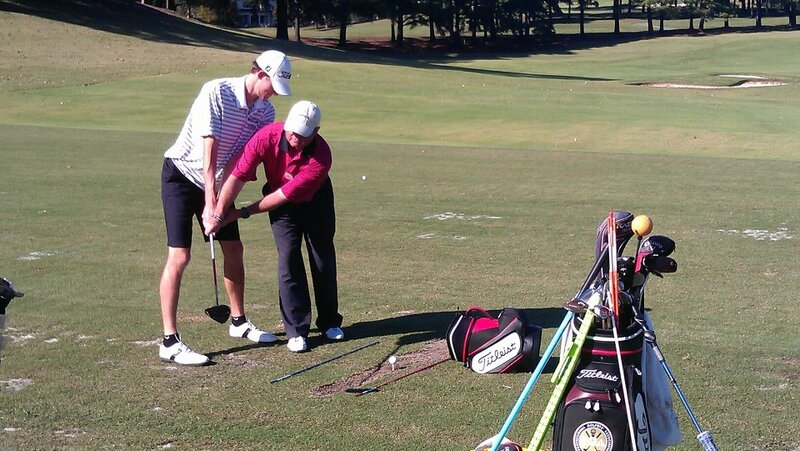 It is hard to explain without video or actually doing it but there is what I call shaft control and body control and they must be done correctly or the student will get poor feedback. Doing this in a mirror helps as well. 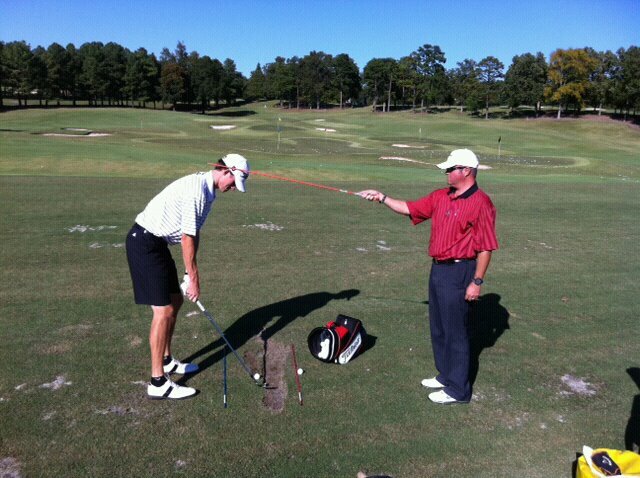 I also recommend (PNF) which is moving the student in opposite direction of the error and having them to resist. This gives them the feedback that they need to move in a positive direction which ingrains the change much quicker. Moving them allows for the student to give you feedback on how it feels to them and that is invaluable. I don’t care what they say or how they explain it, that is the language that I use in the lesson because that it how they relate to it which is most important. (Less Talking More Listening)….starting to make sense. Modeling is simply demonstrating by hitting a shot or doing it slowly (my recommendation). Can be helpful for the student to see it in action. I know this is more for the coaches but it is important for students to give great feedback and let your coach know what you want, how you learn the best and when you don’t understand something. A great teacher can use all that information by explaining it a different way so that you can understand it. Because you, the student are the most important part of this equation and if you feel you are getting left out you need to speak up. Coaches: make it a point to tape yourself giving some lessons this off-season and make it a learning tool because I will be doing the same in order to improve. If we don’t get better, the game doesn’t grow. Well said Jason. Decision training relates to limited bandwidth of the instructor / coach. 2007 publication by Joan Vickers may be of interest to others. Google “Vickers Decision Training” for more.